elfhead had the most liked content! I'd like to reserve judgement until we are absolutely certain there isn't going to be more releases in the coming weeks. But for now I'm somewhat disappointed. I have never liked the aesthetic of the plastic daemonettes and I'm not thrilled they have expanded the look with these new models. I absolutely hate the plastic steeds of slaanesh (the tail is too short and the legs too thick) and I'm really not a fan of the ' boots of skin with feet attached' look. that's why is don't like the new keeper, because the boots make up almost half of the model. The torso and head are beautifull though. But I really hoped for a keeper more similar to the artwork I use as my avatar... Like most of you I was really hoping for some mortals or even slaangor. We've had a chaos release every Christmas for the last couple of years. When we didn't see Slaanesh last christmas I thought they might be holding out for an even bigger event with the story arc of captured Slaanesh. And now it seems it is a regular one or two week release? BUT one of the hosts is still called ' seekers'. Which makes me think Slaanesh is still captured and we might see more for Slaanesh when/if he gets released? That might still be something to get excited about. I also don't like they keep pointing out you can use all these releases in 40k. 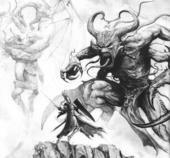 If one of the Warcry warbands looks like Slaanesh mortals (even though they all are undivided) than I'll be happy. As I'm only in it for the holy I'll only need one unit of mortals. I guess I'll just get Sys'Lex and cut off the daemonette on top of him by her weird clunky feet. Slaanesh colour scheme - help! I think it looks pretty cool! By using such a light base with the snow the overall look isn't too dark. the shading on the claws might be a bit too harsh though, maybe lighten that up a bit. I've been working on a Slaaneshi force for a long time now, you can follow my plog on this forum (link below). My daemons look a lot different from yours, with light skintones and dark purples. Could be for the warcry warband that has a flayed face as a symbol. Thanks for the response, i can see your point. I guess that, as someone who doesn’t play, i didn’t consider te gaming side of it. I’ve been Reading these pages since the previews dropped. I don’t het te probleem with the terrain pieces. It’s terrain, it’s niet meant to represent something that aan army always carries around. It’s a way to theme your table to fit your army. I was most happy to read that warcry is a way to expand the chaos esthetic and explore other themes and looks. Looping forward to the other warbands. Small bands like these are a geest way to paint something different without buying a new army. I’m a big Slaanesh fan ever since cult of pleasure in 6th ed. The new models fit in with the other daemonettes, Which i never really liked (especially the faces and feet). I’ll always prefer the ‘Diaz sculpts. So allthough they seem like great sculpts they’re not for me. Except the herald, he is fantastic and I hope we Will see mortal slaanesh followers with a similar look somewhere down the line. I saw the king on Instagram, he is really fantastic. Great colors and great conversion. He somewhat reminds me of the three eyed raven sitting in his tree from GoT. @Zephyr Luckily I took a pic of the base before I attached the miniature. In this phone pic you can see the mosaic. I tried to make it look like a mosaic of a keeper of secrets without being to obvious about it. Citadel AIR paint without airbrush? Yeah I buy these on purpose. Especially white and greys since it tends to get really thick after a while. @DeathCat147 thanks! the scar was one of my favorite parts to paint, oddly enough... by the way I love your project! @daveboy the weird thing is the white was completely white in Photoshop... anyway, thanks for the example. This makes a lot of sense, and I'm trying it out on the model I'm currently painting. I can see how this can help to make some areas look more crisp. thans for the replies and feedback @Gorthor21 @Somanlius. There might be more civilians down the line. But right now I'm actually working on some mini's that will take the army out of the city, which will allow for the samenons and slaangor to roam free along the elves... @daveboy I'm not familiar with the term blackening though. I guess it means having a small line of darker color between different areas? maybe you have some pics to clarify? I figured out a way to get better pictures with less harsh lighting. although I'm doubting if I should go back and adjust the light temperature somewhat, because they appear slightly yellowish. Or is that just me? so here are the same mini's again. Love the look of your warriors. Nice colors and conversions. I think your scenery needs some trees or vines or something?